Foliage: leaves in whorls of 4. Flower: 3/8"-1/2" purplish-pink or greenish-white on short stalks; side petals about as wide as long. Flowering time: Late July to early October. Range in New Jersey: Common in damp ground in the Pine Barrens and locally in the Middle, Coast and Cape May districts, occuring at a few stations north of our limits, but all within the coastal plain. Misc. USDA lists as a facultative wetland + species, i.e., usually occurs in wetlands (estimated probability 67%-99%), more often in wetlands, but occasionally found in non-wetlands. 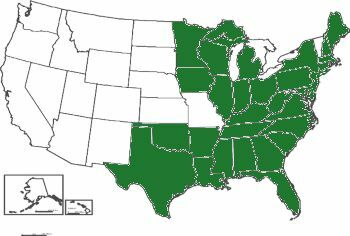 P. cruciata is listed as a species of concern (rare, threatened, or endangered) in eight states throughout its range. 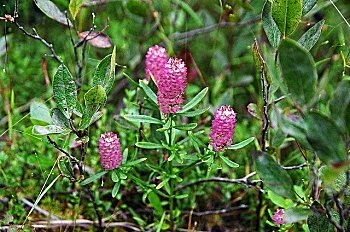 This species, according to Stone (1911), and the smaller P. nuttalli, are the most widely and uniformally distributed species of Polygala; occuring everywhere throughout the New Jersey costal plain...even down to the very edge of the salt marsh. 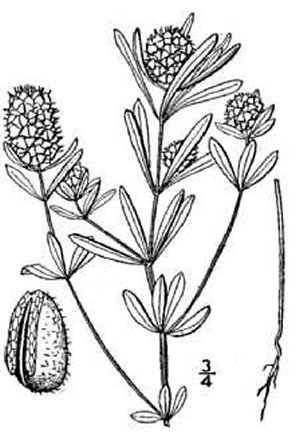 He continues, While usually about the color of red clover, which it somewhat resembles as we see it scattered about among the grass and sedges, Polygala cruciata is sometimes entirely greenish, a condition that is more familiar in P. viridescens, in which the two color phases were originally described as different species.